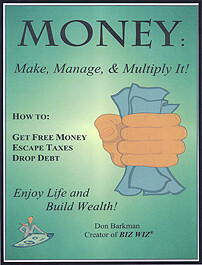 MONEY: Make, Manage, & Multiply It! Trying to Make Your Income Cover Your Expenses? Searching for Ways to Save for a Home, College, Retirement? Do you want to turn financial stress into financial success? If so, Money: Make Manage, & Multiply It! is precisely the book you need to get a better grip on your personal finances. It will guide you through the essentials of managing your money. It is a practical, common sense approach used by the author for thirty-five years. With the Money book, you will learn ways to increase your income, control your spending, take advantage of tax laws to build savings, understand the basics of investing and build a solid financial future. Who should buy this book? It is great for recent graduates, newly-weds, new parents, frustrated savers, and persons trying to prepare for retirement. It is not a "get rich quick" book for making a fortune on Wall Street or buying and selling real estate. Those books are for the gullible. This book is for sensible persons. Most of us receive little or no education on how to manage our money, yet we must earn a living, pay bills, take on debt, and save for the future and the unexpected. Unfortunately, few people do more than use their paychecks to cover their immediate bills. The result is poor money control or worse. Without the knowledge of how to effectively handle money, cash leaks out of their wallets, credit card balances keep climbing, unexpected expenses inflict pain and worry, and the future is ignored. It does not need to be this way. A little bit of effort and self-discipline using simple Money techniques is all it takes. Earning and Increasing Your Income. Spending – and Controlling It. Special Purchases: Home, Car, College. Inside the book you will get tips on using company savings plans to get "free money" and how to invest in accounts where your tax dollars can increase your wealth instead of going to the IRS. You’ll learn that a college education can double your lifetime earnings and discover how to increase your income in other ways. In the Money book, you get practical worksheets to help you construct a plan for controlling your expenses. You will also uncover the hidden force that causes many household budgets to fail and see how to control it. In addition, the book gives you numerous tips for saving money and shopping for major purchases like a home – where you can save $14,000 with one day’s work! The book wraps up with an explanation of many of the principles to apply when investing your savings to create your financial future.